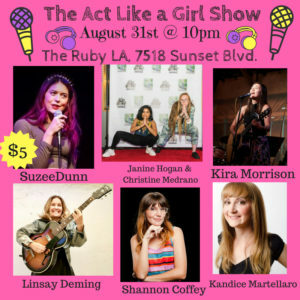 The Act Like a Girl Show 7/27! 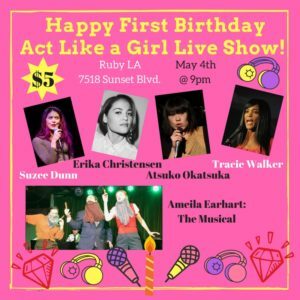 The Act Like a Girl Show is taking residency at The Ruby LA! We will be 7518 Sunset Blvd. on Friday September 28th at 10pm. Hosted by: Suzee Dunn and Madison Shepard Interviews with: Women and non-binary people working their asses off in the industry. 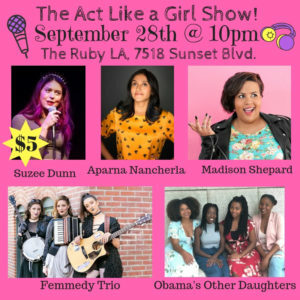 Stand-up from: Aparna Nancherla Improv: Obama's Other Daughters Music from: The Femmedy Trio This show is $5 for the general public and free to Ruby LA students and team members with valid Ruby LA ID. Online ticket sales close 1 hour before show. 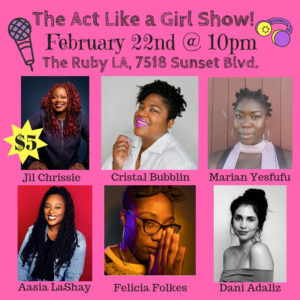 The Act Like a Girl Show is taking residency at The Ruby LA! We will be 7518 Sunset Blvd. on Friday October 26th at 10pm. 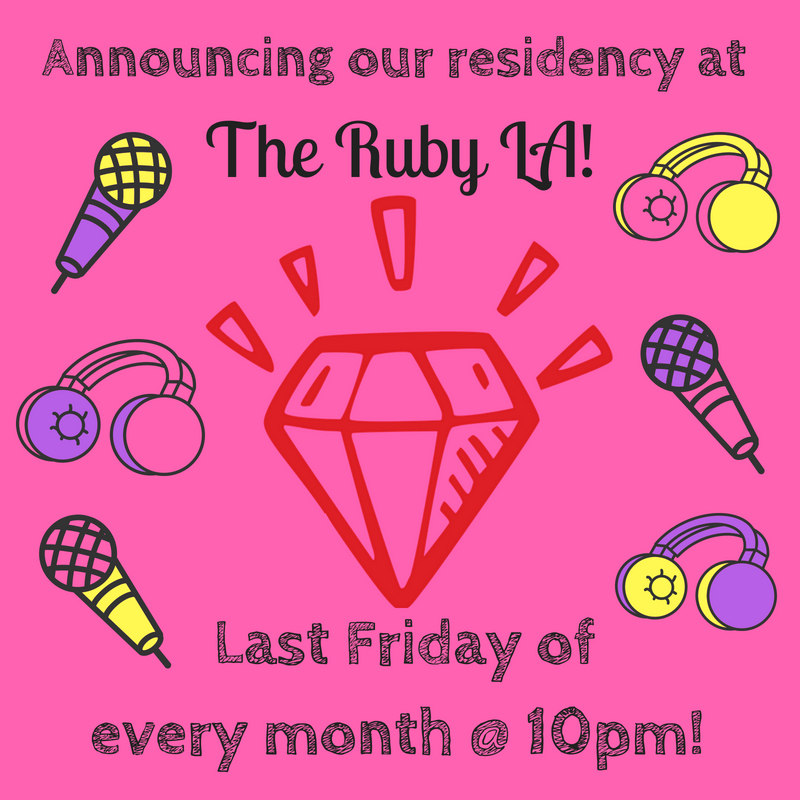 Hosted by: Danielle Perez and Kai Choyce Interviews with: Dani Fernendez Stand-up from: Jordan Kurtzman Characters from: Kaitlin Mamie Music from: Malie Mason This show is $5 for the general public and free to Ruby LA students and team members with valid Ruby LA ID. Online ticket sales close 1 hour before show. 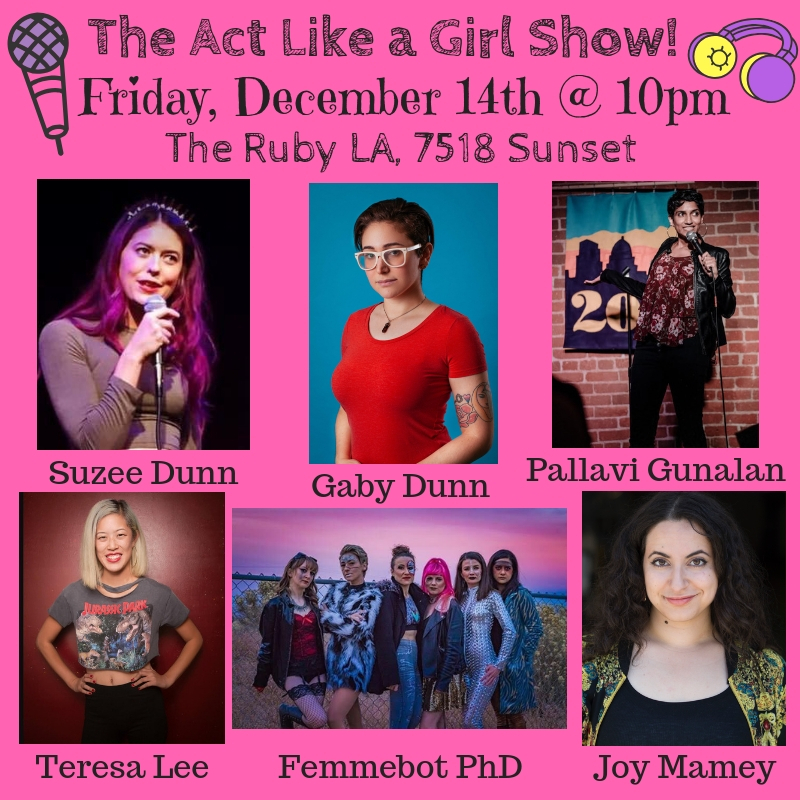 The Act Like a Girl Show is taking residency at The Ruby LA! We will be 7518 Sunset Blvd. on Friday November 16th at 10pm. 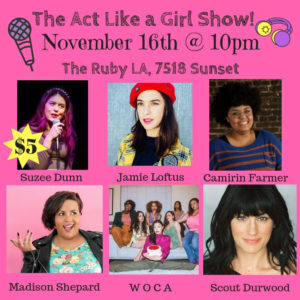 Hosted by: Suzee Dunn and Camirin Farmer Interviews with: Jamie Loftus Stand-up from: Jamie Loftus & Madison Shephard Sketches from: WOCA Music from: Scout Durwood This show is $5 for the general public and free to Ruby LA students and team members with valid Ruby LA ID. Online ticket sales close 1 hour before show. 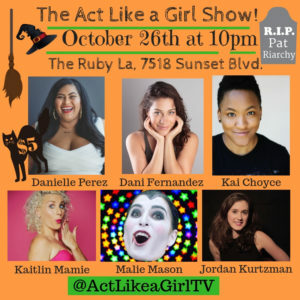 The Act Like a Girl Show is taking residency at The Ruby LA! 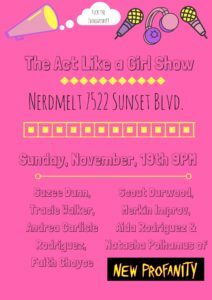 We will be 7518 Sunset Blvd. at the last Friday of every month at 10pm. 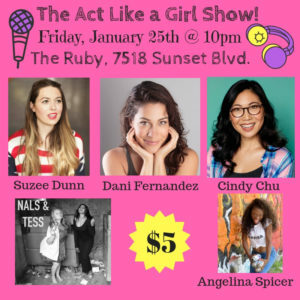 Hosted by: Suzee Dunn and Cindy Chu Interviews with: Dani Fernandez Stand-up from: Angelina Spicer Music and Sketches from: Nals & Tess This show is $5 for the general public and free to Ruby LA students and team members with valid Ruby LA ID. Online ticket sales close 1 hour before show.